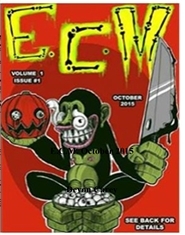 E.C.M. (Elite Critiques Magazine) offers unique connections between writers and readers. Our focus is to publish new and seasoned authors in our themed issues each month. We’re packed full of new and established talent, stories, art and poetry all readers can enjoy. We offer articles, informational pieces, and interviews for writers to glean knowledge. With something for everyone, you’re sure to find a home with us. Welcome! This is our color, Premium magazine. It costs exactly $12.74 to print each copy in color.